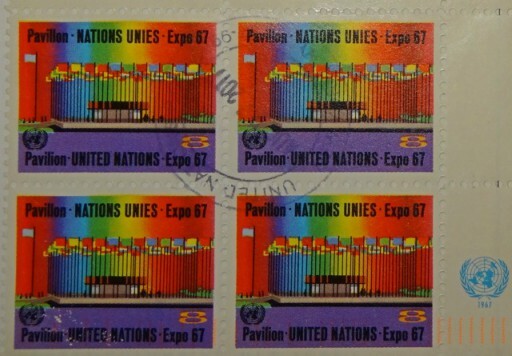 A Postcrosser in New York sent me a card with these United Nations stamps. The only dated one is the one from Expo 67 which I will assume was issued in 1967. The flag series was from the 1980s. The air mail is possibly from the 1960s, judging by the price, and the Human Rights one is from 1989. Why it is written in German, I do not know. In English, it is about the 'right to effective judiciary' - Everyone has the right to an effective remedy by the competent national tribunals for acts violating the fundamental rights granted him by the constitution or by law. 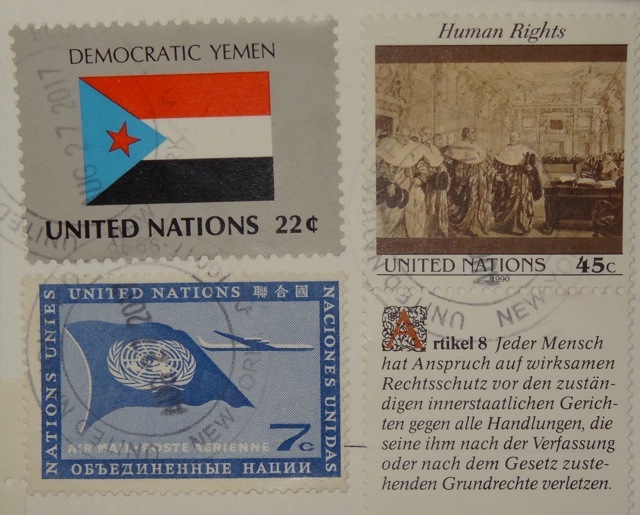 United Nations stamps have been issued since 1951 and have different themes than the regular stamps. You need to go to the UN building in New York, or Geneva or Vienna, to buy them and they must be mailed from their own post office. This could be partly why they are not considered very collectable. ...Happy New Year, my friend. More UH stamps - love it. 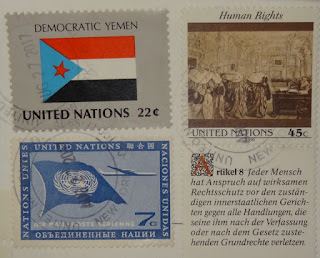 There is an online store for UN stamps ( unstamps.org ), so at the increased cost of postage you can buy them without visiting one of the three UN HQs. Can take a long time to arrive after purchase compared with what I am used to from USPS. They also have a service where you can mail envelopes/cards etc in an envelope stamped with UN stamps to the appropriate location (you can only use NY stamps to send from NY, Geneva from Geneva etc), and they will get stamped and sent out. Takes ages, though. I have sent mail from the NY HQ in person, and after that I discovered the mailing service, which makes life a lot easier. Thank you for sharing - and a Happy New Year! Very nice stamps. 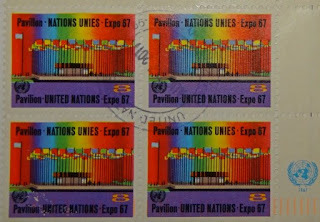 United Nations is a popular choice for this week's Sunday Stamps! Ooh - I went to Expo 67 (as a very young kid)! Peace and Joy to you in the New Year! I like the colourful Expo stamp. Just because I have a couple of covers of the Human Rights series I can tell you that they are se tenant stamps which have the same stamp design but with English, French and German labels. Pot luck which one you get if actually using for postage I think. United Nations must have the most stamps today - what a varied lot.